Easter is such a special time for us and we want to share it with you! 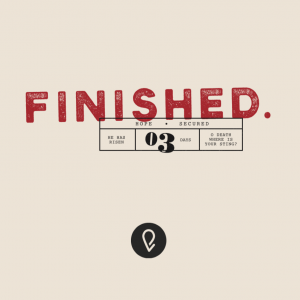 Celebrate the Finished work of Jesus this Easter with us! Our services are Saturday, April 20th at 6pm and Sunday, April 21st at 8am, 9:45, and 11:45. Grab some invites from the kiosk to share with your neighbors and friends! *The 6:00pm service and 9:45am service will be ASL interpreted. Safe Families for Children is an organization seeking to help keep children safe when families are in crisis. To learn more about how you can help with this amazing organization, visit the information kiosk after each service on April 28th, or email Jodi Russo directly. On May 4th, First Baptist Church is hosting the Iron Sharpen’s Iron Men’s Conference from 8:30am-5pm and men from Eastpoint are invited! This seminar covers topics like The Power of a Husband’s Words, Healing from a Father Wound, and more. Register today by clicking here. We are committed to celebrating the significant milestones in a family’s life, like dedicating your child to Christ! We will be having our orientation on May 4th at 10am, and the dedication celebration on May 11th at 2pm. 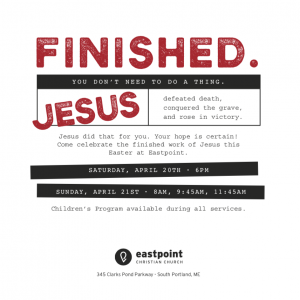 Email matt@eastpoint.church and we will be in touch with next steps. The MOVE Conference is happening this summer for all incoming freshmen – seniors! This is an amazing week full of fun, growing in your faith, and building lasting friendships. Find more information and register by clicking here. Intern Opportunities with Eastpoint! You can now apply to intern with us and learn if God is calling you to ministry. Our internship program is a great way to grow in your character and leadership, and we encourage you to apply! *applications are due by May 31st. For more information and to apply, visit here.